They are replacing standard cans with the kind pictured above that have attached lids and can be wheeled to the truck and automatically emptied instead of being manually lifted. This is NOT the kind with the arm that picks up and dumps trashcans. I’m all for giving the trash guys a break from lifting and emptying cans, but there are TWO major issues here. 1. Cans should be rolled to the curb for pickup. Cans will not be collected from a corral. permitted curbside or within the right-of-way. How many homeowners in BH have trash corrals curbside? I would guess the answer is MOST. 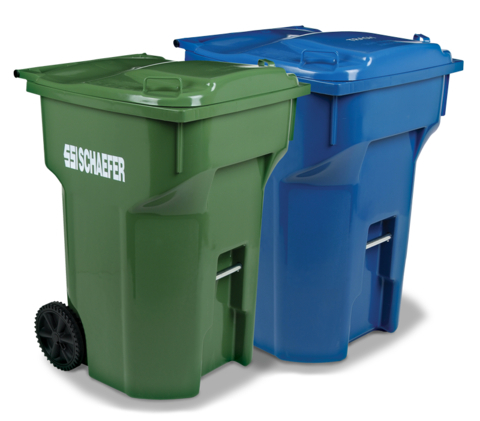 What is wrong with curbside corrals….seems like if we are trying to make things easier on the trash collectors keeping them curbside makes sense. More sense than dragging a 95gallon trashcan across 40ft of stones! If anyone can attend the hearing, please bring up these and other concerns. 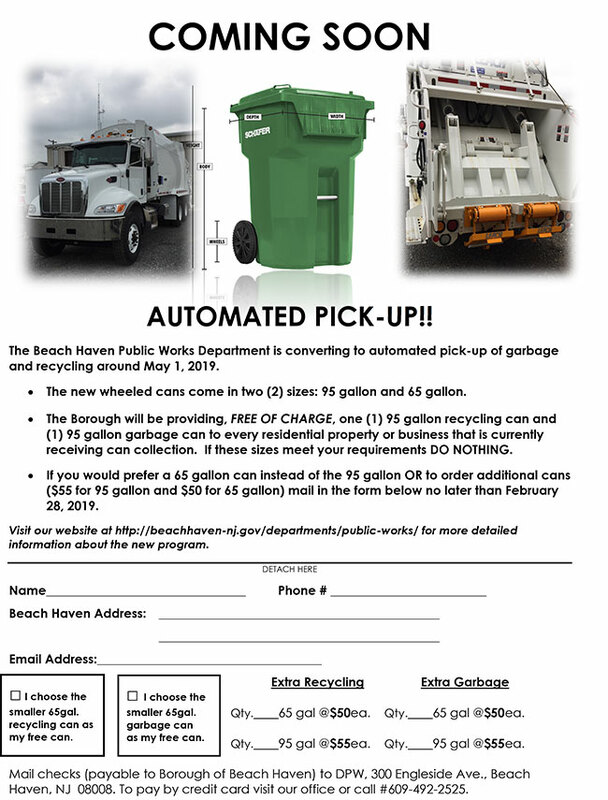 Per the township, the changeover to the automated cans is a done deal, as it has been budgeted and approved. What is still not finalized is the fees for the program and the program details….such as the placement of cans/corrals and so forth. That ordinance has a final reading scheduled for the meeting on 2/11. They claim that having containers set at the side of the house makes it “more efficient” for the workers, but that makes literally NO SENSE. Again, I understand switching to rolling containers with a lift system to protect workers from injury, but how is having workers drag empty cans back to the side of every house in the township more efficient? And what about the owners? Residents will be expected to drag a FULL 95 gallon trashcan from the side of their house 20-30ft across stones to the street? There are many older residents of the township, are they going to do it themselves? How are vacation home owners who spend weekends at the shore going to handle their trash? They aren’t there during the week to roll it to the curb. What about renters, are we going to rely on them remembering when the trash days and recycling days are and making sure to roll out the cans themselves while on vacation? I can tell you firsthand that is a disaster waiting to happen. One renter forgets, a full can is left for the next renter….who piles bags on top of the full can…and then we all know what happens. The seagulls tear into the bags spreading trash all over the neighborhood and resulting in a fine for the homeowner. What about houses that have Bike Lanes out front like those on Beach and Atlantic Avenues. Are we now building obstacle courses for the bicyclists? Do we want families veering into the driving lanes to avoid trashcans? A curbside corral makes things easier for everyone! If this detail is NOT final yet, we really need the public to speak out before it is. From the meeting minutes when this was last discussed on October 18th, it seems like these concerns have been brought up, even by the mayor. Minutes for this month haven’t been posted yet. Here is the actual ordinance if you’d like to read it. If you cannot attend the hearing on February 11th, I suggest you contact the Mayor and Council and voice your opinion. Click on their names to email them. Councilman Charles E. Maschal Jr.
Another thought – What about liability if a renter gets injured trying to drag/wheel cans to the curb? Not all my renters are young/strong. Who is liable? The owner? The township because it was forced on us? I am including this thought in my coorespondance to the mayor/council. Somebody has to be making money on this. Wish we had a way to reach all home owner’s. Doubt anyone supports this. Even my neighbor who does not have a rental unit thinks this idea is crazy. Lee, TOTALLY agree! This was a BIG decision for the Borough to make without the input of the residents. Stay tuned…….hopefully the “powers to be” will listen to us!